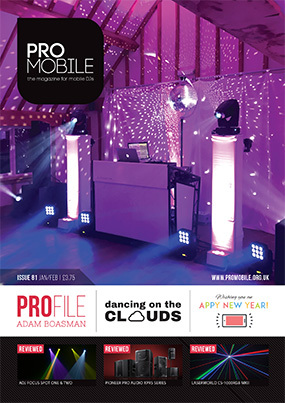 The first issue of Pro Mobile for 2017 is packed with a varied mix of articles covering a wide range of topics, all somehow connected to mobile DJing. Highlights include Tony Winyard’s list of 10 smartphone apps to help you have a more productive year in 2017 and Harry Kilb’s insightful article on the ‘dancing in the clouds’ first dance phenomenon. Richard Lee shares a light-hearted look at the songs that can be used to end a party and new contributor Pat Mulligan tells the story of how he transitioned from being a club DJ to become a mobile DJ. From deserts to DJ has been the journey for wedding host and director of northern mobile DJ multi-op DFC. Tony Winyard shares 10 useful smartphone apps to help make life easier and work more productive for mobile DJs in 2017. Dry ice: a 'magical' upsell, or more trouble than it's worth? Successful mobile DJ Harry Kilb answers this question by sharing his advice and experience. Adam Boasman, Brian Mole, Darren Clark, Eddie Short, Harry Kilb, James Humphrey and Tony Winyard.